Many farmers and entomologists understand the value of this lowly bug, which spends each day digging into turds, rolling them into balls, drinking out the moisture (are you still with me? ), dining on the nutrients, and reproducing. Dung beetles are found on every continent except Antarctica and all of the many different beetle species belong to the Scarabaeoidea superfamily. Think of the scarab, a close relative of the dung beetle; ancient Egyptians revered them. By simply digging through, or tunneling through, cow patties, dung beetles aerate them and reduce methane. Hamilton pointed out that dung beetles live on different types of manure. In Africa, for example, dung beetles help reduce piles of African elephant dung. “They provide different services such as tunneling, consuming, and aerating decomposing manure,” he said. This service helps diminish greenhouse gas emissions and aid in carbon removal, according to a study published in Nature. Around one-third of greenhouse gas emissions come from cattle and dairy farms, and a new study in Science shows how recent rises in methane emissions are likely attributable to agriculture. 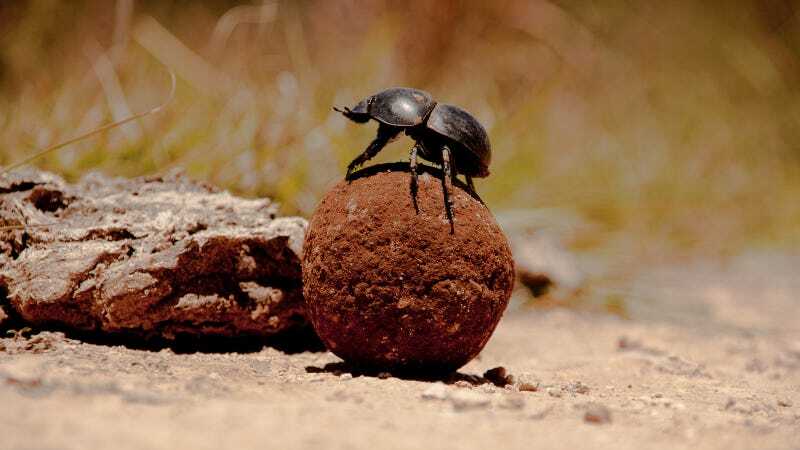 Films like "Cowspiracy" have tried to bring the issue to the attention of the greater public, but the role of dung beetles is often left unmentioned. “By simply digging through, or tunneling through, cow patties, dung beetles aerate them and reduce methane,” P.J. Liesch, extension entomologist at the University of Wisconsin in Madison’s Department of Entomology, said. Researchers from the University of Helsinki reported that cow patties with dung beetles released nearly 40% less methane over a summer period than cow patties with no dung beetles. In the journal PLOS One, researchers from the University of Helsinki reported that cow patties with dung beetles released nearly 40% less methane over a summer period than cow patties with no dung beetles. While most methane released by cows comes directly from the animal and not its dung, this is still a significant percentage. The flies may carry disease and farmers eradicate them with pesticides, which are released into the environment. Also cattle farmers use wormers to destroy internal parasites. Those pesticides and wormers harm dung beetle populations. We don’t need pesticides out in the pastures because the dung beetles take care of the flies. The left-over stored dung that has been buried in the ground makes more nitrogen and carbon available for the use of vegetation. Nutrient rich soil is needed for the health and welfare of soil microbes, fungi, and bacteria. Organic matter is also food for earthworms, which is another one of Ham’s favorite recyclers. Current major threats to dung beetles are pesticides, anti-parasite drugs, and highly managed farms where cows are raised indoors, not in cow pastures. As far as global warming’s effects on this critter, it’s too early to tell. Now, however, it’s the dung beetle who’s making inroads to combat climate change.